Shuko to move! I bet no-one will find his move. this is a quick one, 10 minutes spent. 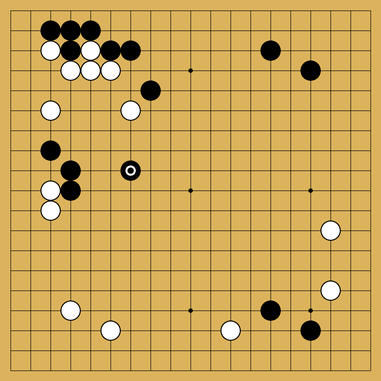 I found two moves for White that looked credible to me. The first one was the obvious jump-out H5. The variations I analysed focused on White attacking Black from above, building a wall in sente by allowing Black to escape, and then returning to pressure Black’s top left group with F13 and aiming to dominate the centre. My other choice (and the one I’d play in the game,) was to play F13 immediately. I expect Black to respond with C12, and then White can either shoulderhit the 3-3 at Q16 to take influence and build a moyo on the top side, or jump out to H5 and start the attack, again looking to build influence. Probably exchanging F13 for C12 and then immediately jumping to H5 would be strongest for White, and only playing Q16 when its value is more clear. Also: the king is dead! Long live the king! Nobody actually died, but Shin Jinseo, age 18, is now the #1 rated player in the world, and highest rated player in history, according to Rémi Coulom’s computations at goratings.org. 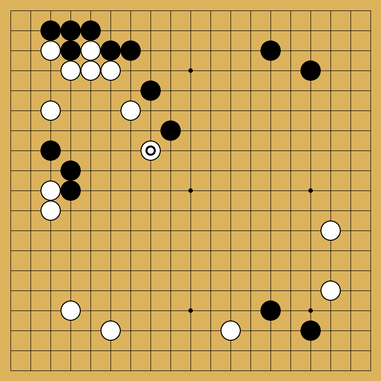 Leela Zero doesn’t seem to agree with the bottom moves, and would have played on the left side starting at move 23. @mark5000 are you planning to post your analysis? I was in particular wondering what kind of aji black could exploit in the lower right corner (maybe starting with S3-T4-Q3?). I’m surprised no one seemed to notice how flat the position was. Or maybe some people did notice; it was just irrelevant to their analysis? Only vinceuji and I looked at pressing moves. The quality of analysis was generally pretty good though, and we got a lot of perspectives for this position, which is pretty great. I totally missed San Diego’s tesuji but gave it some analysis anyway, just later. I totally missed San Diego’s tesuji but gave it some analysis anyway, just later. Thanks for sharing! 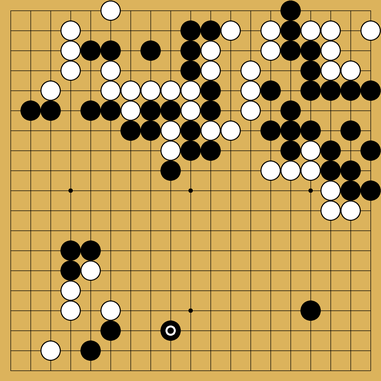 That aji might explain why in the game Shuko chose to add a stone there and prevent black’s extension (I would have used that aji rather than play P2 in your variation). LZ seems to agree with your P2 move, and would just let the right side go in response to black S3 (S3-Q4-T4). Link to the actual game. Thanks for the review !!! I’d already flipped through the game, so I went through I tried to figure out why Shin Jinseo chose the moves he did, and what some other options might be. 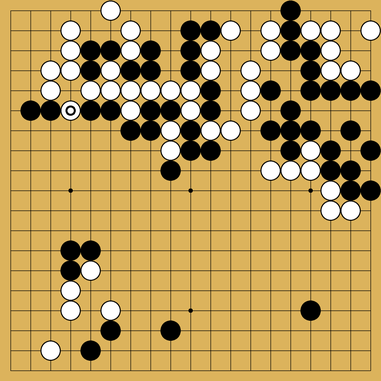 I also checked the position with LZ, to see what the computer line would be, and if it agreed with the moves played in the game. 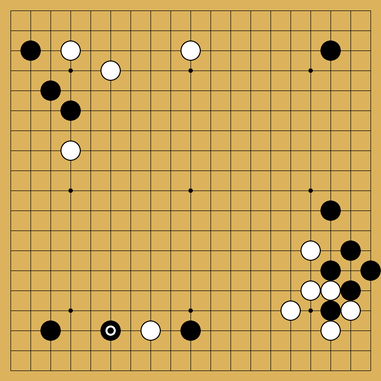 Interestingly, while Shin’s attachment move looks like a very computery move, LZ doesn’t like it, finding no difficulty for white in obtaining compensation for the reduction in terms of influence and territory on the bottom. LZs preferred line combines two of @mark5000’s ideas: the one space jump, and peeping the knight’s move in the top left. Order doesn’t seem to matter, as the two transpose quickly into one another. 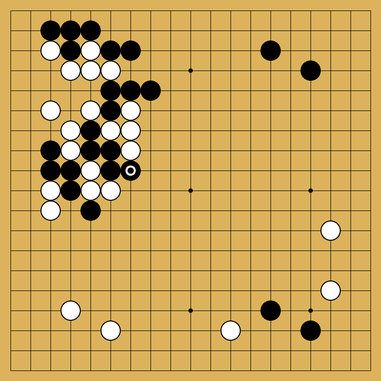 White will link up under black’s group and take the territory, with no real invasion prospect there for black. Here is Board 7. Anyone at any level is welcome to share their analysis of the position. I was surprised to see how my points are different from yours: F6 vs. F7, O3 vs. L3, R6 vs. R3. I completely missed the ladder aji.